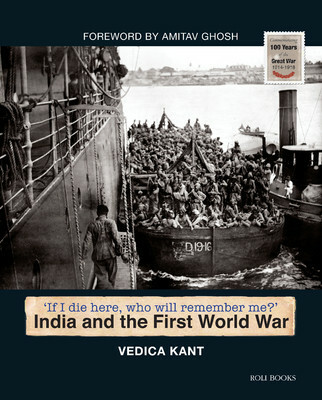 Below is my Foreword to Vedica Kant’s fine new book: ‘If I Die Here Who Will Remember Me?’: India and the First World War published September 15, 2014, by Roli Books, New Delhi. 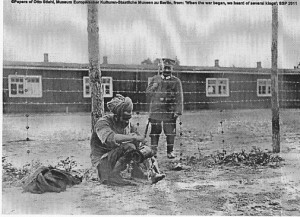 in which a sepoy in a prisoner-of-war camp is seen to be washing his foot while a German soldier looks on bemusedly from the other side of a barbed-wire fence. Whether in captivity or not, the sepoy had always to contend with the gaze of those he served: on the other side of the battle-lines too he would have known himself to be under constant watch, hemmed in by fences that related not only to his physical being but most significantly to the question of his loyalty, this last being a matter of such profound uncertainty that no one perhaps was more unsure of it than he himself. It is this ambivalence above all, that defines the predicament of the sepoy, not just in the First World War, but in many other conflicts before and after. The sepoy’s way of soldiering dated back to a time when mercenary armies were the norm rather than the exception – that is to say, the mid-18th century, which was when the East India Company raised its first ‘Native Infantry’ regiments in the newly-founded Presidencies of Bombay, Madras and Bengal. The First World War sepoy is thus the embodiment of a paradox: a soldier schooled in modern weaponry and tactics but recruited, remunerated and officered by methods that belonged to another era. The sepoy was in other words a warrior of a completely different ilk from the citizen-soldiers who were the main protagonists of the 1st World War: this is one reason why his role in that conflict is so often overlooked, at home and in the West. This is why the Indian[ii] soldier’s experience of the First World War resists appropriation by those who would like to merge it seamlessly into the triumphal narrative of the winning side. The sepoy’s ambivalence, as much as the anomalous circumstances of the army to which he belonged, made sure that his story could not be fitted into the usual frames of ‘victor’ and ‘vanquished’. This is another reason why the sepoy’s role in the war is so often overlooked. Nor did the First World War, which was to result in an enormous outpouring of prose and poetry in English, French and German, have a similar effect on the Indian subcontinent. While Europe produced tens of thousands of books about the war, in India only a tiny number of first person accounts were to find their way into print: to date they can still be counted on the fingers of one hand – and not one of them was written by a sepoy. As for the sepoys themselves, true to their tradition, they left behind very little: inasmuch as their voice can be heard at all it is through their censored letters,[vii] and through the various materials that were collected by scholars in German prisoner-of-war camps[viii]. These sources have only recently seen the light of day and this book is one of the first to incorporate them into a panoramic overview of the Indian subcontinent’s involvement in the First World War. It is a welcome and long-necessary endeavour but it should be noted that on certain subjects there remains a yawning gap in information: for example the role of lascars, who probably contributed more, proportionally, to the seaborne war effort than sepoys did on land. Despite the gaps in the record, Vedica Kant has succeeded, to a quite remarkable degree, in conveying a sense of the texture of the sepoy’s experience and of the conflicted, ambivalent cadences of his voice. It is a voice that cries out to be heard, precisely because it’s story does not conform to the mirrored Western narratives of victory and defeat: what it offers is the possibility of an alternative reading of that history – as a story both of defeat-in-victory and victory-in-defeat. To my mind this is closer to the truth of what happened on the battlefields of Europe and Asia during the Great War than many more familiar interpretations of those tragic events. [i] The Second World War was to produce many similar stories, most notably that of Captain (later Lt-Gen) Premendra Singh Bhagat, winner of the Victoria Cross, and his brother Nripendra Singh Bhagat, who joined the INA in Malaya. [ii] Needless to add, I use the words ‘India’ and ‘Indian’ here to refer to British India, which included most of the subcontinent. [iii] Cf From Sepoy to Subedar, trans. James Thomas Norgate, London 1873 (also pubd. Calcutta: Baptist Mission Press, 1911). The original Awadhi text has never been traced: it is said to have been dictated by Sitaram Subedar to an English officer. The Hindi writer Madhukar Upadhyaya has rendered the English text back into Awadhi in his marvelously evocative book Kissa Pande Sitaram Subedar (Saaransh Prakashan, Delhi, 1999): I strongly recommend it to anyone who can read Hindi (I am grateful to Dr. Ashutosh Kumar of Delhi University for bringing this book to my attention). [iv] Vedica Kant explains the ‘martial race’ policy on p. 27, Chapter 1. [v] The writings referred to here are Sisir Sarbadhikari’s Abhi Le Baghdad (privately printed, Calcutta 1958; listed in the Indian National Library, Kolkata as: Sarvadhikari, Sishir Prasad: Abhi Le Baghdad; Prothom Mahajudhher Khanikta, Kolkata, 1958), and the letters of Captain Kalyan Mukherji, which figure prominently in the account of his life written by his grandmother, Mokshada Debi, Kalyan Pradeep (listed in the Indian National Library, Kolkata, as: Kalyan Pradip, being the Memoir of Captain Kalyan Kumar Mukhopadhyay, IMS, Kolkata, privately printed, 1928). It was Santanu Das’s piece Indians at Home, Mesopotamia and France 1914-1918; towards an intimate history (which is his introduction to the volume Race, Empire and First World War Writing, Das, Santanu (ed. ), CUP, 2011) that led me to both books – I shall forever be grateful to him for this. [vi] My posts can be found here, here & here. [vii] Painstakingly edited and published in a magisterial edition by David Omissi, under the title Indian Voices of the Great War (Palgrave Macmillan, 1999). My blog post on the book can be found here. [viii] The volume When the War Began We Heard of Several Kings: South Asian Prisoners in World War I Germany (ed. Franziska Roy, Heike Liebau and Ravi Ahuja; Social Science Press, 2011) presents a wide variety of these materials; it includes several voice recordings in the accompanying CD ROM. My blog post on the book can be found here. Another Bengali take on WWI can be found in Kazi Nazrul Islam’s novel “Baadhon Hara”. Nazrul didn’t see active duty, but spent some time as a Havildar in the Karachi barracks during the war. The book’s not bad for a glimpse into army life in Karachi during WWI.